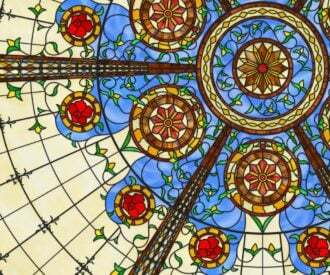 Home » New and Exciting » A Virtual Stained Glass Dome Ceiling! A Virtual Stained Glass Dome Ceiling! We are pleased to present the results of one of our most adventurous and creative undertakings to date. Motivated by recurring requests for a fluorescent or LED lighting solution that is unique, colorful and large, we decided to step outside the box a bit. 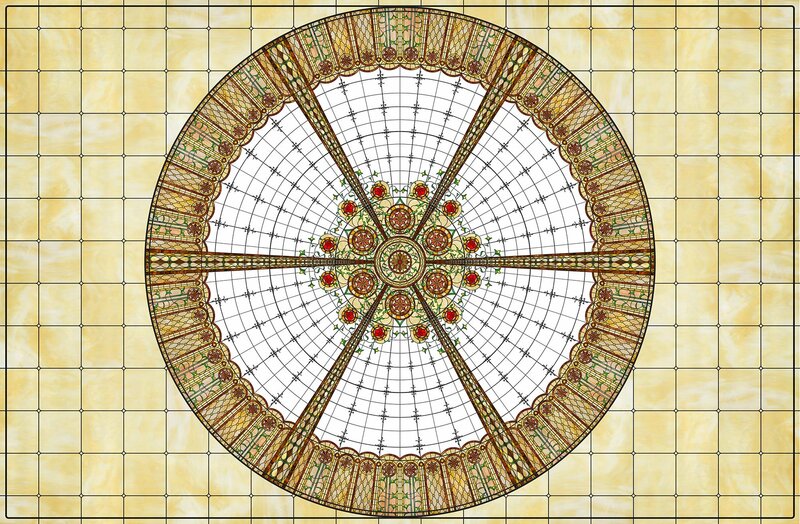 This new “Virtual Stained Glass Dome Ceiling” makes the beauty and elegance of a stained glass dome ceiling available for a traditional two-dimensional installation of premium quality acrylic panels in a drop-ceiling configuration. 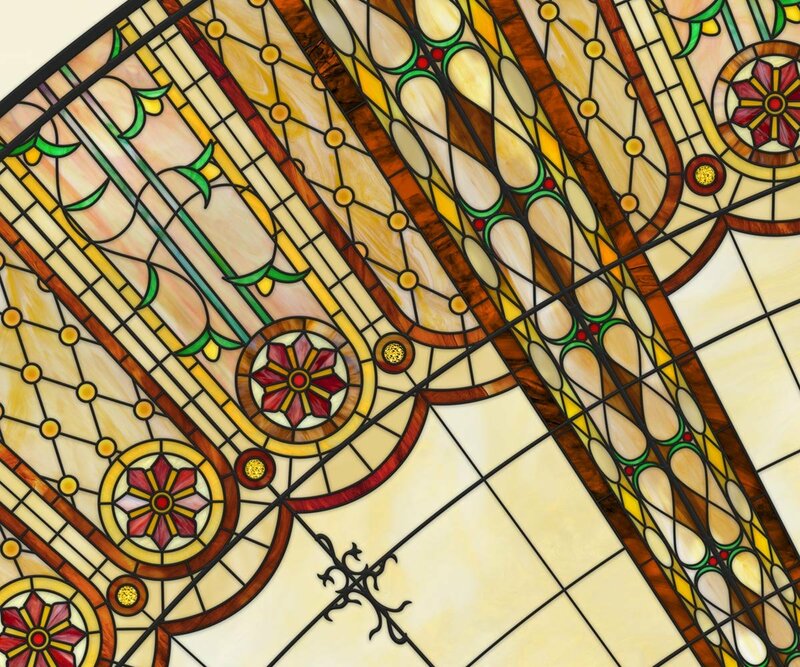 This design was heavily inspired by the gorgeous jewel in the shops of the Paris Hotel and Casino in Las Vegas, as well as the Ceiling of the Lafayette in Paris. Click here to see it in our High Resolution Viewer. The product page shows several suggested colors, however all of them may be adjusted for specific requirements. The main center/perimeter color backgrounds (blue, beige, purple, turquoise, white, etc) are easily modified and can be very closely matched to a target color. The design is suitable for installations of 6 feet or larger, due to the large amount of detail. It is the result of many weeks of creative effort. A typical installation would have a 3×3 grid of square panels as shown to the right. The size of each of the panels could range from 24″ to 50″ in order to achieve the result. As an alternative, other creative support grids could be constructed (or welded) to minimize visual interference of the image. 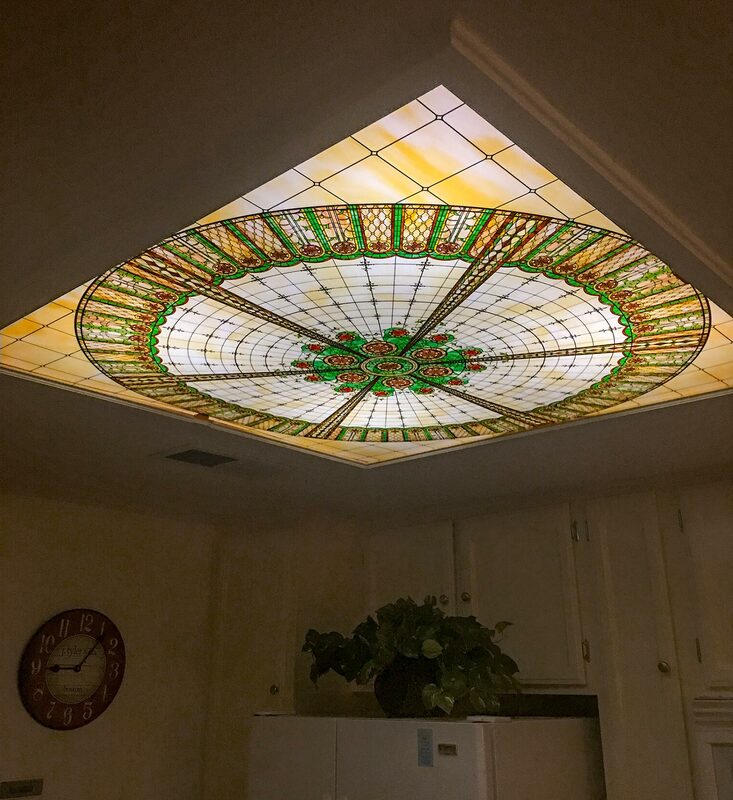 In order to accommodate ceilings that are not a perfect square or circle, the outer grid area can be adjusted to fill the illuminated area not occupied by the circular part of the design. This technique is shown below. The grid background color can of course be modified according to design needs. Rectangular Grid Dimensions are Modified to Fill Extra Area. While most installations will be traditional acrylic, there are some stunning prints now available on high quality fabrics. This would be a method of illumination that does not require the suspended ceiling support grid. Please contact us if you wish to explore this option.